Dive into Alice's Wonderland in a new puzzle game! Alice is known the world over from her beloved fairytale, filled with magic, iconic characters and whimsical story elements. 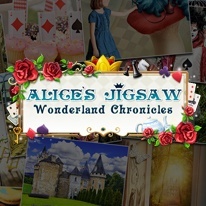 Alice's Jigsaw Wonderland Chronicles features 120 mosaic brain teasers that differ in both speed and length. The pictures are made from high-quality photographs all with specially-picked themes showing the magical world of Alice in a more modern style, including fantastic images, tea parties, white rabbits, pocket and grandfather clocks, card/chess themes and much more. - Get the max number of keys on each level and unlock new worlds!